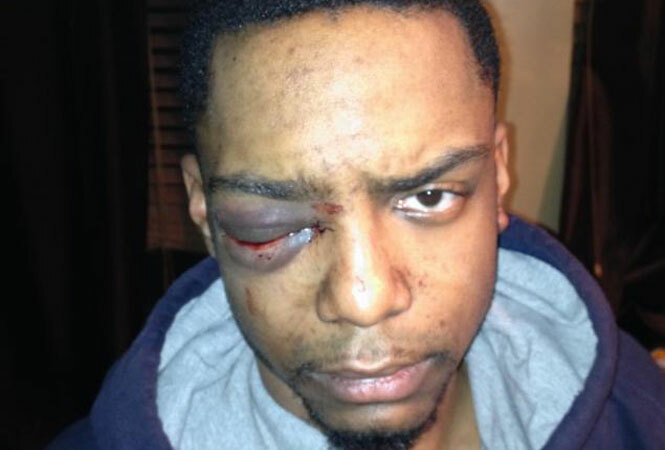 NEW YORK — Five men who prosecutors said were members with a Hasidic neighborhood watch group in Brooklyn were indicted on Wednesday in connection with a brutal beating of a gay black man in December. Taj Patterson, in a photo taken shortly after the attack. Taj Patterson, 23, a fashion student at the New York City College of Technology, said he was attacked in the early morning hours of Dec. 1 by more than a dozen ultra-Orthodox men shouting anti-gay epithets. Authorities say the suspects were part of the Williamsburg Safety Patrol Unit, a local civilian watch group in the heavily Orthodox section of the neighborhood, and stopped Patterson while he was walking home. The group claimed to be investigating neighbors’ reports that Patterson had damaged cars, but didn’t call police. Even after the reports of vandalism proved to be unfounded, the group, which grew to about 15 members, surrounded Patterson, held him down and punched and kicked him, according to prosecutors. The attack left Patterson blind in his right eye. Aharon Hollender, 28, Abraham Winkler, 39, Mayer Herskovic, 21, Pinchas Braver, 19, and Joseph Fried, 25, were charged with gang assault and other counts, but not with any hate crimes, authorities said Wednesday. The alleged attackers have been released on bail and face up to 25 years in prison.